In the middle of the hustle and bustle of Old Havana, Cuba, sits a surprising refuge for the children of the Santo Ángel neighborhood. The Barbe Parque is a whimsical collection of colorful playscapes, swings, and seesaws located only steps away from the former presidential palace, now known as the Museum of the Revolution, which was the site of a coup attempt prior to the 1959 Cuban Revolution. The museum now stands as a symbol of the overthrown Batista regime, and visitors can see the bullet-riddled walls from the failed assassination attempt on Batista’s life. Also in the same neighborhood sits the famous Granma, the boat that taxied Fidel Castro and Che Guevara from Mexico to the shores of Cuba on their daring journey to overthrow the Batista regime, resulting in Castro’s decades-long reign as leader of the island nation. Amid the history of former government buildings and military armor, this quiet refuge has a purpose unlike anything else around it. In this place, children can play, snack, and visit with one another. The playground is also notable because of its unique theme, which is reflected in its name—the Barbe Parque. Behind the playground equipment is a covered area containing a chair, cabinetry, and mirror—the fixtures of a barber’s trade. Apprentice barbers practice their future trade by giving haircuts to local children at the playground. The theme is also reflected in the playground equipment itself, which is all designed to resemble items found in a barber’s shop. The seesaw resembles scissors as they open and close, the slide looks like a shaving blade, the jungle gym mimics the silhouette of a hair dryer, the trash cans look like hair rollers, and children can stand behind a wall of cut-outs that feature varying hairstyles. Founded in 2013, the Barbe Parque is the creation of Gilberto Valladares, also known as Papito. He works as a barber in a salon that has become a museum of hair salon antiques and hair styling-themed art. He is also an organizer of Arte Corte, a local community project that supports children and the elderly within Havana. Cuba is home to many community projects that have supported the country’s most vulnerable populations through community outreach and engagement. Through Arte Corte, Valladares approached several government entities with an idea to create a space where children could play and barbershop interns could practice their trade. 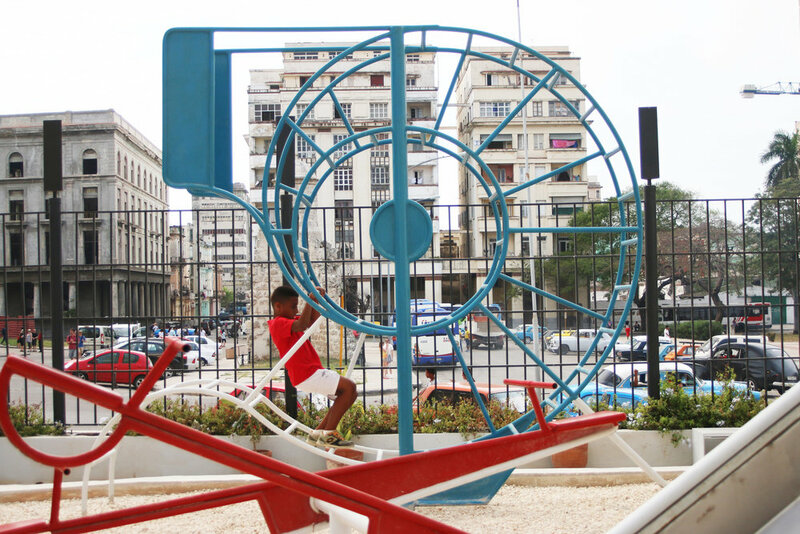 Because Havana is a busy city, only a few spaces were available for children’s playground equipment. After several rejections of his idea, the Office of the Historian of the City of Havana agreed to secure a location, which turned out to be the neighborhood space next to the Museum of the Revolution. Now, the area serves as a place not only where local children can play within the busy neighborhood of Old Havana, but also where apprentices from the School of Barbering and Hairdressing can practice their trade by providing haircuts for the children. As Gilberto Valladares stated, “We like to dignify things in the community.” For the children of the Santo Ángel neighborhood, the Barbe Parque is definitely a dignifying space for play and fun.